Remember, last month I spoke about at app that provides salon services at home? Well, I just found one more and they're even better than the last! 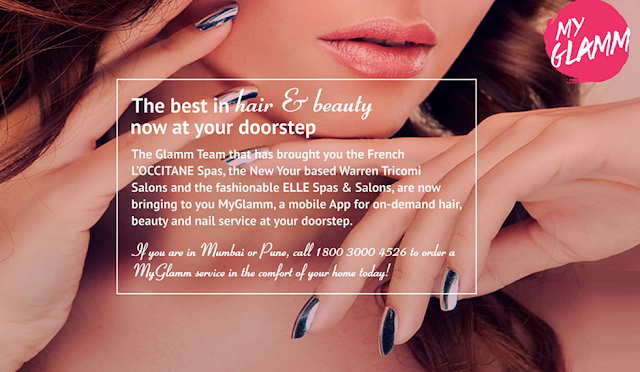 This one's called MyGlamm and they provide bespoke on demand hair, beauty, spa & salon services at your doorstep. It has been launched by the Glamm team of the French L’Occitane Spa, New York based Warren Tricomi Salon, and the fashionable ELLE Spa & Salon, ensuring that customers get an international standard salon experience at home. What impressed me the most is that they use premium brands like Forest Essentials and Moroccanoil, which I use personally on a day to day basis so this increased my comfort level with the entire experience. They recently started services in Pune and provide a wide range of salon and spa services like beauty, hair, spa, nails and bridal makeup. I think its awesome that they also do nail extensions so you can get your nails done sitting at home. How cool is that? Check out all their services here. You also have the freedom to choose your price point so if you're low on budget you can pick a junior artist and if you're in the mood to indulge you can request for a senior stylist. I chose to get a Forest Essentials advance facial and a Morroccanoil hair spa ritual and was very very impressed with both. The therapist, Sunita was extremely polite and professional and explained each step of the facial and hair spa to educate me about its importance. Like I mentioned in an older post, I am a huge fan of Forest Essentials products. I use their shower gel and it smells so divine and leaves my skin so soft that I feel like I'm in a spa every day. The Forest Essentials advance facial consists of cleansing, scrubbing, steaming, blackhead removal, product penetration using ultrasound along with 20 minutes of a face massage followed by a 10 minute back massage and finally face pack application. Now to be honest, I find the face massage part of facials extremely boring. I never found it relaxing and always wanted it to end as fast as possible as it bores me to death. So naturally, I requested the therapist to cut it short before she even started but (thankfully) she denied saying that it is a entire process which uses different techniques on certain pressure points so the whole process must be followed. And within five minutes, I was thanking her because it felt so great. Kudos to her because for the first time in about three years I actually enjoyed the face massage. This was followed by the back massage which was just uber relaxing. By the end of it, I felt totally zenned out and was actually feeling sleepy. And that, my friends, is the sign of a great massage! Moving on the hair spa, I had just reviewed two Moroccanoil products in these posts, so was glad that the same brand would be used on my hair. The hair spa ritual consists of a 60 minute hair spa session with steam and 15 minutes of a relaxing massage. She instructed me to wash my hair with the Moisture repair shampoo to cleanse my hair and scalp and prepare it for the hair spa. Now I already use the Moroccanoil Intense Hydration Mask, and since I complained about how damaged my hair is, she used the Restorative Hair Mask which she applied to each strand meticulously following which she gave my hair some heat for the product to penetrate. This was following by a back and shoulder massage and thankfully I did not fall asleep this time because I was sitting upright! After this, I washed my hair and she applied Moroccanoil treatment to it and blow dried it. Well, what can I say, my hair was just so soft and silky! The best part was that my hair had that fabulous Moroccanoil smell for more than 2 days. Full marks to them! A notable factor with the way both the facial and the hair spa were carried out is the incredible level of hygiene. The therapist was equipped with everything that was required for the service and when she wrapped up, my room looked exactly how it was before we even began our beautification process. 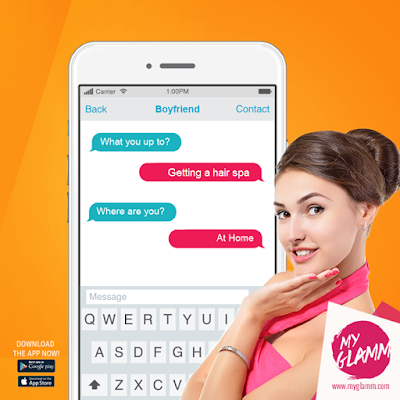 So all you need to do to get glamorous at home is download the MyGlamm app! Just choose the service you wish to avail, select a date and time, check real time availability of artists, provide your address and you're ready to get Glammed! I need that app in my crazy busy life. How cool. That's for sharing. Cool app! I'll check it later. Aw such a nice app! Lovely post June! Thanks for sharing! The service seems awesome, but I would feel weird about inviting people into our home. The hair spa sounds lovely! What a great service! that sounds like a greeat service!